The 2019 888poker LIVE Bucharest Main Event champion has been crowned and it was Darius Neagoe that followed into the footsteps of Andrei Racolta to keep the trophy on home soil in the Romanian capital after defeating Bogdan Nicolae in an all-Romanian heads-up duel. Hosted in cooperation with Pokerfest Romania at the five-star InterContinental Bucharest, the €888 Main Event surpassed the guarantee and created a prize pool of €387,638 thanks to 505 entries in total, also topping the 469 entries of the previous year. 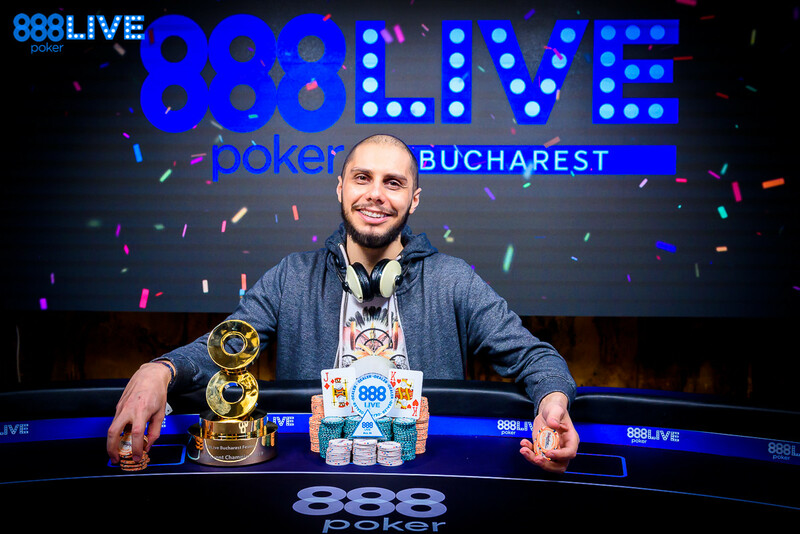 After cutting a deal in heads-up with Nicolae, Neagoe had locked up €62,300 for his efforts and Nicolae was secured a payday of €59,900 before they battled for the title, trophy and 2019 WSOP Main Event package worth $12,600, courtesy of WSOP sponsor 888poker. Both Neagoe (more than $563,000 in online MTT cashes) and Necolae (more than $1,860,000 in online MTT cashes) are accomplished online players, the latter also finished 13th in this very event one year right here in Bucharest. Six different nationalities were represented on the nine-handed final table and third-place finisher Zhiping Zeng, who hails from China, lives in Romania and speaks the language fluently. 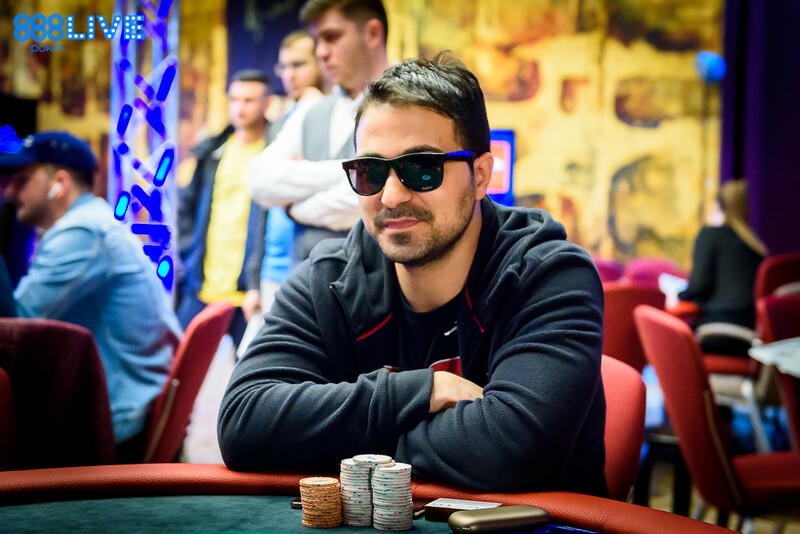 Among the notables to cash on the final day were Ran Shahar (7th place, €12,400), Aldo Monteleone (9th place, €7,020), Raoul Iancovici (11th place, €5,900), and Jose Manuel Planells Castillo (12th place, €5,070). The top 63 spots were paid and 888poker ambassador Sofia Lovgren finished in 22nd place for €3,140. Other well-known names on the European poker circuit that cashed include Toni Judet (13th place, €5,070), Radu Lungu (20th place, €3,540), Bogdan Berinde (25th place, €2,740), Sergiu Cornea (47th place, €1,840), Ozgur Arda (50th place, €1,840), Peter Jaksland (51st place, €1,840), Mihai Niste (61st place, €1,740) and Danut Chisu (62nd place, €1,740). 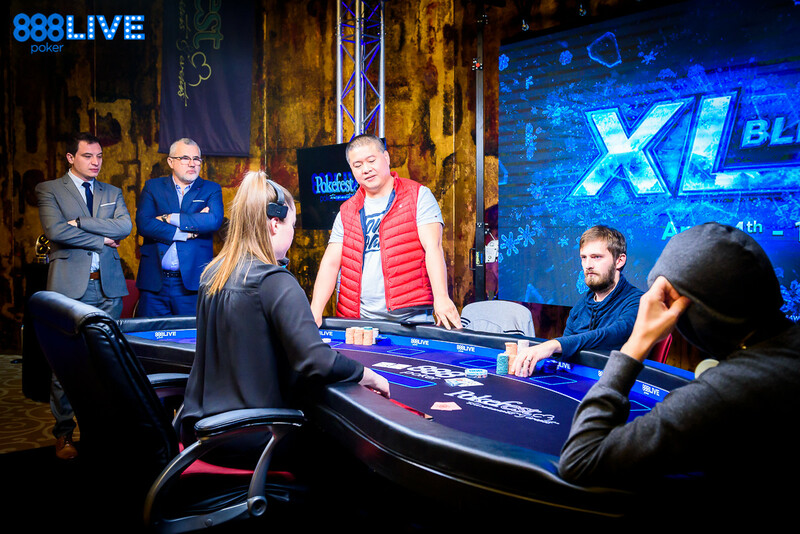 Only 12 players returned to ballroom of the InterContinental Bucharest at lunchtime and there were two commanding chip leaders in Zhiping Zeng and eventual champion Darios Neagoe, all other 10 finalists had fewer than 20 big blinds at their disposal. While Zeng pulled further away at the top of the counts, Neagoe had a rough start into the day and doubled up short stacks several times. Just when no player at risk could seemingly lose an all in, two players were sent to the rail in a matter of a minute. Jose Manuel Planells Castillo came up short with ace-seven against the king-queen of Bogdan Nicolae and Neagoe dispatched Raoul Iancovici with queens versus king-ten suited. However, Neagoe was suddenly thrown to the bottom of the counts when he doubled Aldo Monteleone (twice) and Mihai Gheonu. Over on the other table, Nicolae's kicker played with ace-eight versus ace-five to eliminate Cristian Matei and set up the nine-handed final table. Once the final nine moved to the feature table, Neagoe scored a crucial double against Monteleone and the Italian never recovered from that setback to finish in 9th place. Neagoe then won a big pot off Zhiping Zeng, who bluffed with queen-five suited on an ace-high board, and that propelled Neagoe into the top spot. He would not relinquish that position anymore until the final hand of the night. Derek Reid had nursed an enormous short stack for quite some time and eventually lost a flip with eight-six suited against the pocket deuces of Mihai Gheonu. Neagoe flopped top pair with king-nine suited and looked up Ran Shahar's jam, who had an open-ended straight draw. Shahar's outs increased significantly when he paired up on the turn and received an additional flush draw, but the player from Israel couldn't get there. Down to the last six, it was an endurance challenge for the short stacks and Nicole Suciu jammed at the wrong time with ace-deuce, as Darius Neagoe had ace-ten one seat over. Suciu was drawing dead on the turn and Neagoe pulled further away at the top of the counts with more than half of the chips in play. Bogdan Nicolae then doubled through Neagoe and knocked out Helder Ferreira eight after when spiking a two-outer with sixes versus nines. The rush didn't stop there just yet, as Nicolae also claimed the stack of Mihail Gheonu with queens versus ace-three and suddenly there were just three players remaining. Zeng and Nicolae traded the bottom position and clashed in a crucial all in with Nicolae at risk, holding the ten-nine. Zeng showed ace-deuce and nine-four-deuce flop improve Nicolae. Zeng hit trips deuces on the turn only for Nicolae to hit a nine on the river for a dramatic roller coaster double. Nicolae doubled once more and Zeng then hit the rail against Neagoe with ace-seven versus queen-ten suited. Heads-Up play lasted for just over half an hour and Nicolae doubled once to almost even out the stacks. Both players agreed on a deal to leave the trophy and package for Las Vegas up for grabs, and Nicolae never recovered from a failed bluff against two pair. It was over a few minutes later in classic coinflip fashion and Neagoe had the best of it with king-jack versus pocket tens thanks to a jack on the flop. 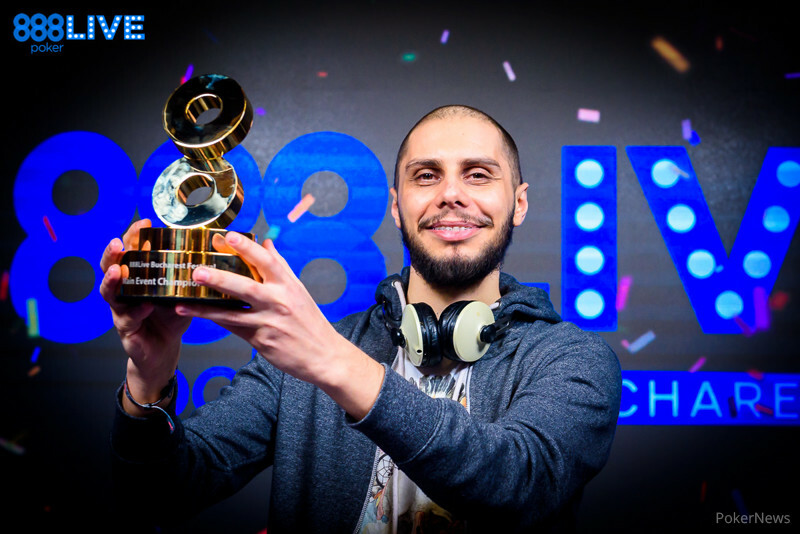 That ends the PokerNews live reporting from the 888poker LIVE Bucharest festival and the next stop of the popular mid-stakes circuit will take place at the end of May, right before the 2019 World Series of Poker. Down to 2,900,000, Bogdan Nicolae got his stack in and Darius Neagoe made the call. Neagoe once again had the king-jack in the showdown for the possible victory and held two overcards this time. He improved to top pair on the , while Nicolae had six outs with his gutshot and inferior pair. The turn was a blank, as was the river, and both players shook hands. According to the deal the duo agreed to, Nicolae takes home €59,900 and Neagoe claims €62,300 for his efforts, the trophy and the 2019 WSOP Main Event package. Bogdan Nicolae raised to 500,000 with and Darius Neagoe called with . On the flop, Neagoe checked and called a bet of 400,000 by Nicolae to see the turn. Neagoe checked once more and Nicolae now made it 1,200,000 to go. Neagoe called and improved to two pair with the on the river, which he checked. Nicolae used a time bank and checked his stack before sliding forward a bet of 2,000,000. Neagoe used a time bank himself and made the call to establish a commanding lead. The 888poker LIVE trophy and the 2019 WSOP Main Event package worth $12,600, courtesy of WSOP sponsor 888poker, are still up for grabs for the eventual champion. Cards are back in the air with a slight chip lead for Neagoe. After the all in and double up, both players asked for the clock to be paused in order to discuss deal numbers. The first all in and call in heads-up saw Bogdan Nicolae at risk for 3,700,000. The board came and Nicolae doubled to almost even out the stacks. Bogdan Nicolae jammed with the and Darius Neagoe folded the . Soon after Nicolae limped the and Neagoe checked the . 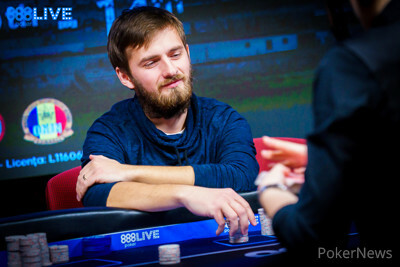 On the flop, Neagoe check-folded to a bet and Nicolae chipped up to around 20 big blinds. Darius Neagoe and Bogdan Nicolae are back in their seats and a limped pot emerged right away with Neagoe holding , Nicolae the . On the flop, Nicolae bet 200,000 and Neagoe check-raised to 600,000, which Nicolae called with his gutshot. On the turn, Neagoe bet once more and Nicolae folded. Out of the small blind, Darius Neagoe moved all in and Zhipeng Zeng called for 2,300,000. Neagoe took the lead on the flop, while Zeng added a few more outs on the turn. 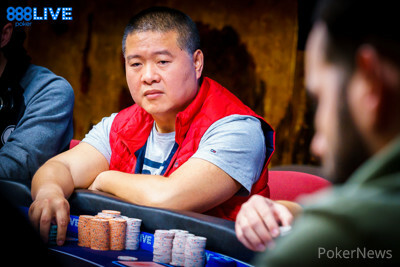 Nothing changed with the river and that spelled the end for Zeng in 3rd place for €33,960. Neagoe and Bogdan Nicolae agreed to a 40-minute dinner break right after before playing down to a champion.